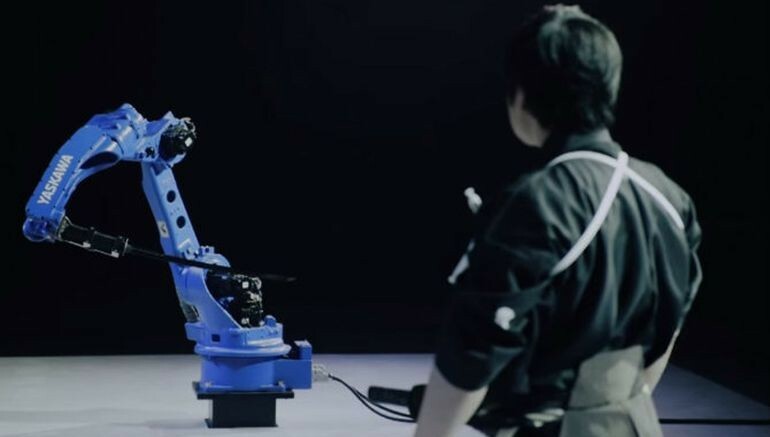 Samurai robot shows some deft sword-wielding moves – after mimicking a human swordmaster! When it comes to robots, we have had our share of badass conceptions ranging from the ones that can put out fires to ones that can smartly overcome heavy weights. But what about a robot that can wield a deadly samurai sword? Well, that is exactly what Japanese robotics company Yaskawa Electric Corporation has achieved with their Bushido project. Originally conceived as a MH24 Motoman robotic arm used for industrial and medical applications, the contraption was ‘modified’ by an ingenious technique. This involved the use of a special motion capture suit worn by 5-times world champion Iaijutsu martial artist Isao Machii. And, it should be noted, Machii is known for cutting BB pellets in half mid flight – with his katana! So as a result of this sensor-studded attire worn by Machii, the engineers were able to record the master’s extraordinary skills and motions in wielding the dreaded samurai sword. The collected data was then fed into the aforementioned robotic arm – thus transforming the machine into one of Machii’s ‘prized students’ (a process which took place over a period of months). In essence, the robot was not only able to copy his gestures, but also make note of his subtle sword-positioning and complex body stances. Anyhow, beyond just wild theoretical elements, the engineers wanted to actually test out how much the samurai robot had ‘learned’ from its organic counterpart. So they opted for an ultimate showdown between the man and the machine – by pitting Isao Machii against the robot in a competition that entailed cutting various stuff. This included flowers, fruits and even tatami mats. But the ‘piece de resistance’ of the showdown pertained to a tough sequential act that would encompass making a thousand consequent cuts. Suffice it to say, Machii – in spite of showcasing his brilliant skills, was a bit tired after the end of the grueling test. But his robotic counterpart showed no signs of stopping. Now at the end of the day, this does sound impressive if gauged objectively. But the undertone of arming our already effective robots certainly harks back to the popular fiction-oriented trope of ‘robotic overlords’ (hello The Matrix! ).